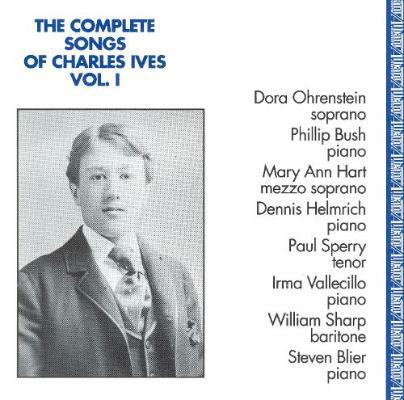 Ives's 114 Songs has been a major source of inspiration for me (particularly for my 69 Love Songs and 50 Song Memoir). But that wasn't all he wrote: from 1887 to 1926 Ives wrote 193 songs, and here they all are on six CDs: lullabies, Christmas carols, German operetta emulations, mortal laments, parlor ballads, cowboy dirges, and even election-day commentary on 'Nov. 2, 1920 (An Election)', and 'Vote for Names! Names! Names! ', of which Ives says, "The [three] pianos represent three political candidates, each uttering his own 'hot air slogan'; the singer represents the disillusioned voter." The texts come 80% from poets (Keats, Kipling, Oliver Wendell Holmes, and many anonymous sources) and 20% from Ives himself, whose aw-shucks Americana (as on 'Slugging A Vampire') and gleefully jarring harmonies keep the surprises genuinely surprising.